Welcome back everyone, this review is an extra sneaky special one for a couple of reasons. The first is that I lost track of how many Blog Tours I signed up for because there were so many books that sounded interesting on offer! And secondly, I love ancient civilisations and I’m fascinated by how others see them and then convey them to others in their books. With this one we start of in the future, roughly 2300 (I don’t remember exactly), where time travel is possible to the point where they send one person once a year to go back in time to interview someone famous. Only problem with this is that you can’t do anything to change history in any way otherwise your time there will be erased. So our main character Ashley is sitting in the chair preparing to travel back to interview Alexander the Great before he went and conquered all the way to India. As she’s sitting there waiting for the storm and for the time travel to occur, we learn a little bit about her life up until then. And boy does it not sound pretty! After a not so successful interview of Alexander the Great, Ashley walks back to where she came in ready to be taken back to her own time. Only problem is, Alexander decided he liked her and wouldn’t let her go and inadvertently stopped her from returning to her own time. And this is where it starts to get really interesting! Up until this point it’s been kinda standard kind of time travel going back in history kind of themes. But now we’re solidly back in Alexander’s time with no possibility of getting back to the future, but every possibility of being erased from history forever. From this point I really felt for Ashley. It’s one thing to keep a secret for 20 hours, quite another to do it for a lifetime. Especially when she doesn’t know the customs or languages. As we progress through the book, we start to learn why Alexander was so determined to travel east and conquer everyone in his path. But remember this is a work of fiction, not fact! I found it easy to get wrapped up in the story and found myself wishing I could travel back in time to see the world as it was then. But the sad reality is if that technology does get invented, it won’t be in my lifetime. There were quite a few points in the book where Ashley’s relationship with Alexander made me wish she could tell him everything. To see how he’d react to that kind of news. I can’t even begin to image how hard it would have been keeping your entire history before you met someone a secret would be. I’m pretty sure my partner knows pretty much everything about me, including how much credit card debt I stupidly wrack up! As I creeped towards the end of the book, I began to wonder how we could possibly get back to the point in time where the prologue was set. And I got my answer when I finished the book and it said, “End of Book 1”. So bad news was, I didn’t get all the answers I wanted. Especially to the driving force of the story. But the GOOD news is that there will be a second book! Yay! Hopefully I get to participate in that tour too! Thank you for taking the time to read another review today and I hope you enjoyed it, on Monday I will be reviewing Love Heart Lane by Christie Barlow. Jennifer Macaire is an American living in Paris. She likes to read, eat chocolate, and plays a mean game of golf. She grew up in upstate New York, Samoa, and the Virgin Islands. She graduated from St Peter and Paul High School in St Thomas and moved to NYC where she modelled for five years for Elite. She went to France and met her husband at the polo club. All that is true. But she mostly likes to make up stories. 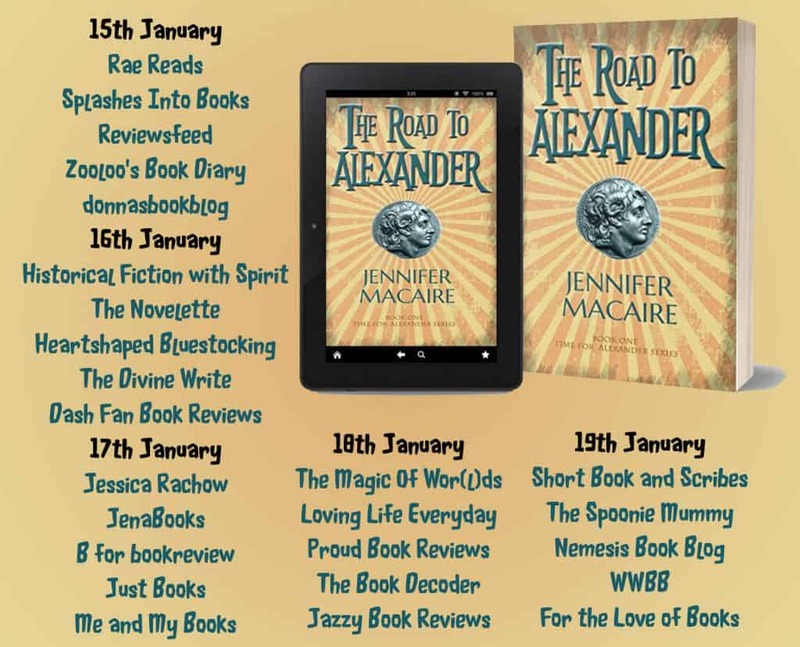 A time traveller goes to interview Alexander of Macedon and gets stuck there. What will she make of this unfortunate situation while avoiding being wiped from history? Click, read, like, comment and share!